Stuart Hogg hopes to take inspiration from a famous relative when he makes his first Scotland start in the Six Nations clash with France on Sunday. The 19-year-old full-back has recently discovered a family link with Northern Ireland football legend George Best. "It's pretty amazing and I hope I can follow his example in the good ways," said Hogg. "He was renowned for his skill on the pitch. "I'm not the kind of person that does daft stuff off it (the playing field)." Best rose to prominence as a precocious teenager at Manchester United and dazzled crowds with moments of brilliance on his way to two league titles and 1968 European Cup success before ultimately squandering his rare talent. On his link to Best, Hogg explained: "My dad has always wanted to find out about his family history. "To cut a long story short, it turns out that my granny's granny was a Best." 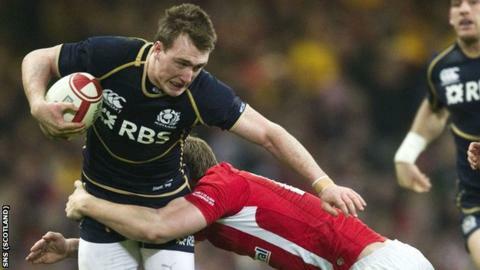 Scotland head coach Andy Robinson has promised that Hogg will have the "freedom to play" for the visit of the World Cup runners-up after shining as a replacement against Wales. Hogg was cruelly denied a debut try in Cardiff, with referee Romain Poite incorrectly ruling that he had knocked on Nick de Luca's pass with the line at his mercy. However, despite that setback and the 27-13 loss, the Glasgow Warriors star enjoyed his first taste of international rugby. "It sent a shiver down my spine to be at the Millennium Stadium and I can only imagine it will be 100 times better at a packed out Murrayfield," he added. "It might be hard to hold back the tears. It's a dream come true." Hogg has featured as a centre at club level this season and can also fill in at fly-half but says full-back is his preferred role. "I think it's my best position," he explained. "Hopefully, France kick a lot to me and I can show what I can do. "It's a massive challenge but I'm really looking forward to it." Greig Laidlaw ended Scotland's try-drought with a consolation touchdown in Wales and Hogg believes the Edinburgh fly-half can inspire the Scots to a first win in this campaign. "We've got the right players in the right positions to take us forward," he said. "Greig at 10 has been unbelievable of late. If he's on fire, no doubt the rest of the back line can perform. "And hopefully we can finish off our chances when they come to get a vital win. "I like there to be open space but to get there you might need to go through the tiniest of gaps. "So it might take a little bit of footwork and a dummy beforehand. "At 15 you can look up and see what's ahead and visualise what's going to happen. "France are a great team. They defend very narrow, so we'll look to exploit space out wide."